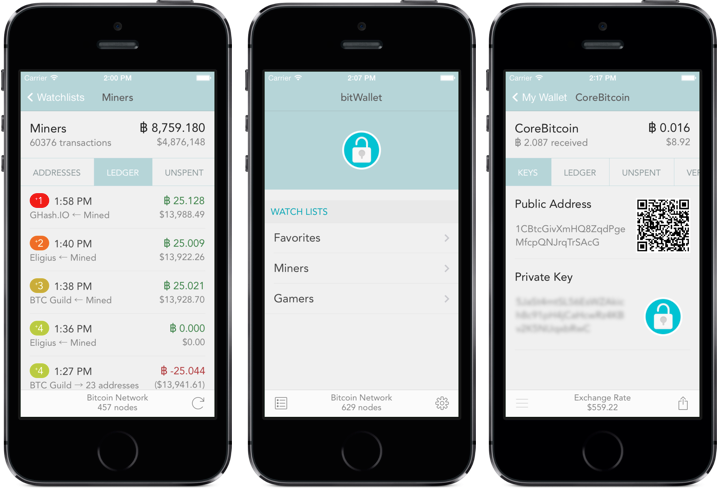 bitWallet™ is a Bitcoin Wallet for iPhone. It securely stores your Bitcoins and shows account balances, transaction history, exchange rates and much more. ✔ Securely store your Bitcoin addresses and their private key. ✔ Create multiple wallets with multiple Bitcoin addresses per wallet. ✔ Create Classic wallets and BIP32 Hierarchical Deterministic (HD) wallets. ✔ Send Bitcoin payments directly from the app. ✔ Dynamic fees for timely confirmations at minimal costs. ✔ Print paper wallets to store your Bitcoins offline in cold-storage. ✔ iCloud backup protects your Bitcoins if the iPhone is lost or damaged. ✔ Receive notifications when new transactions occur in your wallet. ✔ Create Watchlists to follow interesting Bitcoin accounts. ✔ Check balances and transactions per wallet and per Bitcoin address. ✔ Verify balances and transactions from multiple data sources. ✔ Check the Bitcoin price, in multiple currencies, from all Bitcoin exchanges. ✔ Shows live Bitcoin Network statistics. ✔ bitWallet™ is FREE, for now. - Wallets: bitWallet supports two types of wallets; Classic wallets accept all Bitcoin addresses and private keys. New random addresses can be generated, and existing keys can be scanned and imported. Hierarchical Deterministic (HD) wallets derive all accounts, addresses and private keys from a single master extended key. HD wallets adhere to the BIP32 address generation method and wallet structure. Wallet seeds and deterministic keys are derived from BIP39 mnemonic sentences. - Data sources: data is pulled primarily from Blockchain.info. Balances and transactions can be verified against BlockCypher and Blockr.io. Exchanges rates provided by BitcoinAverage.com are limited to 100 updates per day, per IP. Additional data sources will be added as they become available. - Data Security: bitWallet uses advanced techniques to encrypt the wallet using AES-256 encryption. Your password is not stored on the device or anywhere else - if you forget your password there is no way to decrypt your wallet and recover your Bitcoins! When the wallet is decrypted, the Private Keys still remain encrypted in memory until needed to resist memory scrapping attacks. For added security, a setting is available to clear the wallet data from memory when the app is backgrounded. Data is never placed in a web browser and it never leaves the app's memory space, unless printed, shared or backed up. iCloud Backup data is encrypted with the password before transmission. - Optimized for iPhone 6 and iOS 8. - Payment requests now include the bitcoin:// URL scheme. Tap the link to quickly send payment. - Payment entry made simpler..
- Rescan HD wallets for addresses with balance. - Support for BIP32 Hierarchical Deterministic (HD) wallets and BIP39 mnemonic sentences. - Support for compressed keys. - Fixed numbers formatting for some regions. - Minor improvements and fixes. Comments, suggestions, ideas or questions are always welcomed.